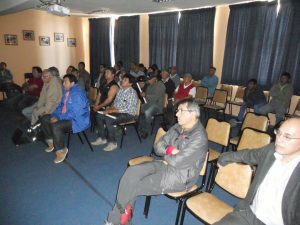 IFOP along with SUBPESCA issued research results about monitoring sword fish and sharks to artisan fishermen from Lebu. The objective of this meeting was to share results with the fishermen. Results related to sword fish monitoring and laws concerning accompanying fauna and recapture projections of conventional marking from 2016. Prefessionals closely related to the Follow up projects of highly migrating species along with Mr Francisco Ponce. Held an Assembly with Lebu fishermen Labor Union to consider the ecosystemic and fishing approach. Jorge Azocar, researcher from the IFOP’s Environment and Oceanography Department – mentioned that the objective had a dual purpose. To share monitoring results for incidental fishing and to socialize the sword fish and sharks marking program in order to get all the actors such as armers and tripulations closely related on recapture of marked specimens involved. About incidental fishing new legal body it distinguishes among the group conformed by reptiles, mammals and marine birds that represent some degree of compromise in their conservation status. In the same way containing emblematic species of wide world distribution. Our country has signed several international agreements for this species protection. For all of the above it is very important to consider what was discussed with fishermen and to thank their collaboration performing liberating activities guided by Scientific Observers. The other objective was to request collaboration to recuperate information from the marked specimens, marking program was explained, its objectives, techniques and types of marks used along with the process through which we want to recuperate these marks. It is important to point out that during last year there were two cruises from the marking program over which satellital marks were applied and there was an intensive conventional marking, tripled marked sharks during the past ten years. This aims recapture probabilities.